Romantic Gift Basket Ideas for Many Occasions! Valentine’s Day Gift Baskets – Ahh, the holiday of love! Cupid is working overtime on arrow duty, and couples everywhere are enjoying some much-needed quality time together to focus on one another and how important their relationship is in their lives. Just as no two relationships are identical, neither are the Valentine’s Day gift baskets that would be perfect for your lovely lady or gentleman. Our selection includes awesome options for all tastes, whether your cutie loves cookies, candy, champagne or roses! Bridesmaid Gift Baskets – While your friendship with your bridesmaids isn’t romantic unto itself, it’s likely these special ladies in your life are more familiar with your relationship than anyone else! The bond we share with our closest girlfriends in unlike any other in our lives. Many if not all of your bridesmaids have been with you through thick and thin – an eager ear on the other end of the phone to hear about every aspect of your relationship from the first date to the ring! Honor that priceless friendship with a beautiful bridesmaid gift basket you know she’ll love. Chances are different baskets will appeal to different friends, so it’s a good thing we have such a spectacular selection! 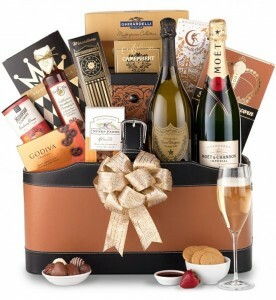 Grand Champagne Gift Basket – Perfect for popping the question! Whether you’re planning to propose at home, or while away together on vacation, our Grand Champagne Gift Basket helps you set the mood while providing all the necessary celebration essentials. If you will be surprising that special someone with a trip, consider gifting this beforehand and tucking the travel tickets or accommodations information inside for them to unveil. You can then suggest you bring the basket along to enjoy while you’re away, and either tuck the ring inside for them to find, or simply keep it close by when you do propose so champagne is at the ready!